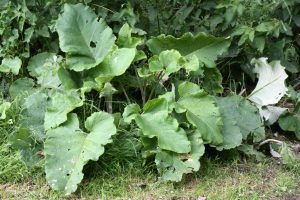 Commonly found growing along roadsides and in wasteland, burdock is easily identified by its large rhubarb like leaves & thistle-like pale purple flowers that shoot up in it’s second year of growth. Burdock has many uses both internal and external, primary of which are its action as a lymphatic and blood cleanser. The root can be used as a tonic to nourish the glandular and immune systems, liver, kidney, blood, lungs & nerves, giving strength and emotional stability to the entire being. The root is high in vitamins & minerals including iron, magnesium, Vit. A and chromium, as well as protein, fiber and mucilage. Through its blood cleansing action and cooling, soothing nature, the root and leaf are used to clear the skin of blemishes, tumors, rashes, burns, itches & to sooth the pain of swollen joints and limbs. Burdock can be used internally as a tea or tincture and externally as a wash or infused oil. The freshly harvested roots can also be eaten in a variety of ways and are quite delicious! Make a tincture of burdock to use the root medicine year round. Harvest the root either in the spring or the fall when the medicine is most potently present in the root. Great for a gentle cleansing of the blood and liver for any skin conditions. Combine with calendula. Dry root also makes a pleasant tea. Drink for skin issues, as a tonic or for balancing the digestive system. Combined with yellow dock and dandelion root makes a powerful stimulating medicine for the liver and digestive system. Wash and cut burdock root into matchstick sized pieces. Taking care to select out any particularly fibrous bits & peeling off the skin if you feel so inclined. Fill a small saucepan ⅓ of the way full with water and bring to a simmer. Add burdock roots and parboil for 3 minutes. Strain out burdock and reserve the cooking liquid. Fill a jar with the sliced roots (I find wide mouth pint jars work perfectly), packing them in as much as possible. Add in ginger and garlic to taste, I often do 1 tbsp ginger + 1 clove garlic per pint. Make a brine to cover the roots of equal parts vinegar & reserved cooking liquid, adding tamari to taste. Place in fridge and let sit for at least a day or two before eating. These fridge pickles will last quite a while and only get better with time! This crunch, savory and spicy preparation makes an amazing appetizer that because of its medicinal bitter quality, also primes digestive function and prepares the palate for the meal to come. Slice burdock into thin matchsticks and soak in an equal parts mixture of vinegar and water for about ten minutes. Drain, then mix with a little seaweed (arame is great, shredded nori works too), sesame seeds, minced garlic and grated ginger. Add a little oil, salt and pepper to taste. Cautions/Contraindications: Widely used as a food and considered safe however may cause allergic reactions in a few people allergic to asteraceae plants.